Lisa E Design Blog: Happy Spring! 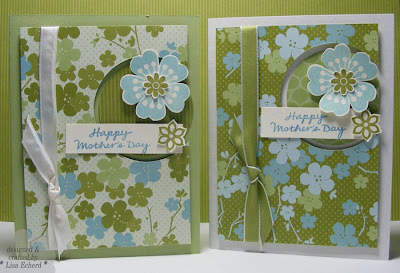 This design is cased from Kristina Werner's Finally Friday last week which you can see on her blog or at http://www.twopeasinabucket.com/ I loved how the layout used a large piece of designer paper - large for a card anyway. Plus, you can use a fairly busy DSP; those are sometimes difficult to figure out what to do with. I think this is a very versatile layout. I used Creative Memories cutting system. One one of the cards, I cut the small circle first and then the large circle without moving the cutter. I just turned the small circle over and used the backside for the card. The large piece of DSP is popped out and it takes a LOT of dimensionals to do it that way. It is supposed to be a gorgeous weekend here in N.C. Happy Spring to you (or Autumn as the case may be) and enjoy your weekend wherever you are. DSP, Old Olive and Very Vanilla Taffeta ribbons also by SU!